The J4 Midget was made available to the MG fraternity in the spring of 1933 and this car along with the J3 completed the J series range. The J series were first announced in August 1932 prior to the Motor Show of that year with Cecil Kimber too impatient to wait for the annual gathering of the worlds motor manufacturers displaying their new models. The whole Midget range was in need of rationalisation and this was most certainly achieved with the J types. With only the J1 and J2 available initially, the J1 carried four seat open and closed bodies, whilst the J2 was the open two seater sports version. Some 9 months later the J3 and J4 versions followed with the J3 basically being a supercharged J2 and the J4 the out and out racing car. This new range replaced the M, C and D type Midgets which were by now becoming outdated. It was the M type that started the Midget series in 1929 and from this model evolved the C type Montlhery Midget which was the first MG produced specifically for racing. 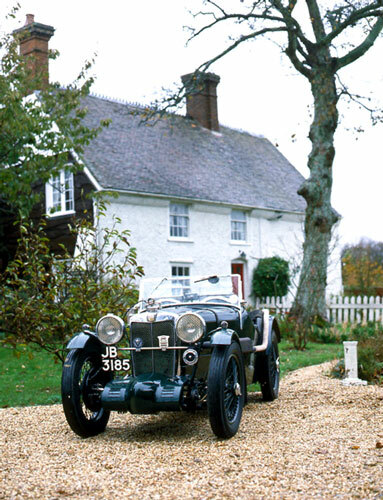 Each racing model produced by the MG Car Company had to be economically priced and yet cover its limited production run costs. This was achieved by commonality of parts with the sports cars that were marketed alongside. In the case of the C type, its sports counterpart was the D type which carried either a four seat open or closed salonette body. The three models described were all being produced together as a complete range. At the same time however a new series of light six cylinder cars was introduced commencing with the F type Magna. This car, although looking quite different to the rest of the current range was in fact a good illustration of the use of common components. Excluding the engine which was really M type with two extra cylinders added, the F type was made up mainly from parts used in the C and D types. The J type chassis was derived from the C and D types but the power unit and gearbox was quite different with the engine sporting an eight port cross-flow cylinder head that increased output to 36bhp with a capacity of 847cc but still retaining a two main bearing crankshaft. The old three speed gearbox with roots in the Morris Minor family and used in the D and M type gave way to a new four speed gearbox with remote control gear lever. Most important of all was the revised body styling which was to become the yardstick for most MG models that were to follow over the next twenty years or so, the basic design was also copied by other sports car manufacturers of the time. The design showed its race bred origin with humped scuttles and deep cutaway doors and a large externally mounted slab type fuel tank which also had the spare wheel mounted on it. The two seat J2 was soon to be acknowledged as one of the classic sports cars of all time and a car that was both functional, economical and blessed with quite lively performance. The J2 appeared initially with cycle wings but a year later the car sported long swept which to many was a retrograde step, however it seemed that WIG had a recipe for a design that was to change little through the different models until 1955. The J3 was essentially a supercharged J2 but had a 750cc engine similar to the earlier C type and utilising the bore and stroke of the race prepared MG's but without a counterbalanced crankshaft. This size of engine was retained for all the racing Midgets until the arrival of the PB Midget. The bodywork was very similar to the J2 and was intended for road use although many found their way into competition achieving good results in rallies and trials. The racing J4 was produced as a replacement for the C type which had been proven too fast for its (and the drivers) own good. Supercharging the C type made it an extremely quick car but limitations of the braking system caused its demise. There was every intention of making the J4 racer go even faster and to date all the small MG's had carried 8" brake drums. As a result new brake gear had to be developed for the J4 but price constraints would not allow for producing anything special for it. As it happened, the F type Magna replacement, the 6 cylinder L type afforded the opportunity for utilising its 12" drum brake system. So with L type brakes, J2 chassis frame and axles, C type gearbox the J4 was born. The body was door-less and the power unit was in full racing specification and carried all the latest developments. This was a very fast car indeed and certainly not for the faint hearted, in fact there were very few drivers who could handle the car properly. Abingdon seemed to be pushing the boundaries of chassis design to the limit with the J4 by putting such a powerful engine within. The large 12" brake drums all round went some way to help arrest the car from the high speeds it was capable of and a new type of split track rod end steering was employed which alleviated the common problem of 'kickback' associated with normal systems. This split link system was adopted on all MG racing cars in 1933/34 including the K series cars. The J4 was supercharged and there was listed an unsuper-charged version, designated J5, however this never went into production, probably because of the limited interest shown at the time in the J4.There were infact only nine J4s produced, with cost probably being a limiting factor as it had a selling price of £495. As already described the J4 was a very fast car with several runs of over 100 mph being recorded at Brooklands. There is no doubt that through continuous development of the J type from J1 to J4 it captured the imagination of the true sports car enthusiast. Valve Operation: Overhead through vertical dynamo. Carburation: Single SU with various Powerplus Superchargers. Power output: 72.3 bhp at 6000 rpm. Gearbox: 5peed manual ENV 'crash' type. Wheelbase: 7’ 2" Track: 3' 6" front and rear.